The 29-year-old rapper has broken streaming records in each of the three weeks his new album has been on sale, beating that of Beyonce's album 'Lemonade' which pulled in 115 million streams when it was released in April. In its first week, 'Views' was streamed 245 million times - when it was only available on Apple Music. The following week it got 141 million streams before shooting up to 185 million streams last week when it was released across other streaming services. The album has stacked up a total of 572 million streams in the US alone. 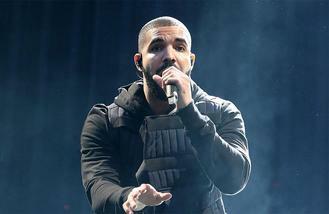 As a result, Drake has overtaken Justin Bieber to become the most-streamed artist on Spotify and to top off his success, he landed his first US number one when single 'One Dance' reached the top spot last week - although Justin Timberlake has since pushed him off the top spot with his new single 'Can't Stop This Feeling'. Meanwhile, over in the UK, 'Views' was number one in the album chart the same week as 'One Dance' hit the top of the singles charts. Fans can catch Drake on tour in the US with Future, Roy Woods and DVSN between July and October but he is yet to announce any UK shows for 'Views'.